What Is Da Form 67 Series? What Is An Officer Evaluation Report? Beginning in April 2014, the U.S. Army will change their officer evaluation reporting system to a new format to analyze and rate officer performances in a manner more in line with Army doctrine, moving away from the DA Form 67-9 and switching to the four DA 67-10 Forms. The key difference is the method of data collection: the DA 67-9 was a universal form regardless of the rank of the officer being rated while DA 67-10 series is divided into “grade plates”, separating the officers into four groups by rank. The DA Form 67-9, Officer Evaluation Report is still listed as active on the Army Publishing Directorate and may be used. 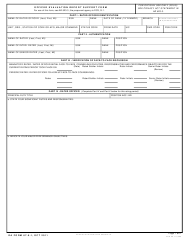 Fillable DA 67 forms are available for download and digital filing below or can be accessed through the Army Publishing Directorate website. The Army officer evaluation process is a series of actions and assessments used to measure an officer’s ability to lead by example and their potential for promotion. This evaluation includes an assessment of ethics, character, mental and physical characteristics, leadership skills and the understanding of core Army values. This information is recorded in a series of reports, which are then forwarded to the Department of Army Headquarters (HQDA). These reports are a means of providing the HQDA with all of the relevant information about the officers’ performance. Officer Evaluation Reports are prepared by the rating chain, which includes the rater and senior rater. Sometimes, if necessary, an intermediate rater can take part in the process. The rating period lasts for at least 90 days. 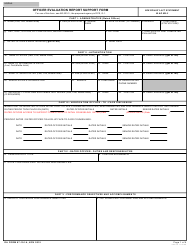 At the beginning of this period, the officer receives a copy of the Support Form, where they must accurately describe their duties and responsibilities before handing in this copy during a face-to-face discussion with the raters. During the rating period, the officer must perform their duties as usual, but under supervision. Face-to-face counseling is also part of the process. 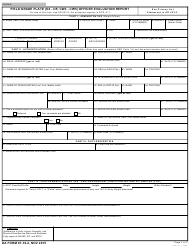 At the end of the assessment, the officer must sign the report and add comments if they feel the need to do so. The DA Form 67-9, Officer Evaluation Report and DA Form 67-9-1, OER Support Form are the key forms in the officer evaluation process. The DA 67-9 is prepared by the rating chain and is forwarded to the HQDA to provide all necessary information about the officer. The DA 67-9-1 supports this form. Being partially filled by the officer, it evaluates the understanding of duties and assesses the officer’s ability to evaluate their own performance. 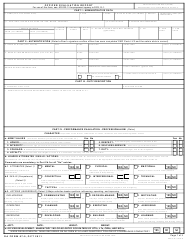 The 67-9 Series also includes the DA Form 67-9-1A or Developmental Support Form, which is mandatory when evaluating junior officers. It is filed by the rating chain as the result of personal counseling and includes a developmental plan to help the officer transfer into their Army career. DA Form 67-10-4, Strategic Grade Plate General Officer Evaluation Report. None of these forms should be confused with the DD Form 67, Form Processing Action Request. 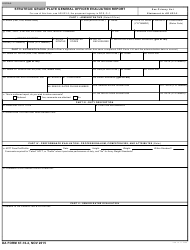 The DD 67 is a form used to request the issuance of a new Army-related form and to cancel or renew an existing one. 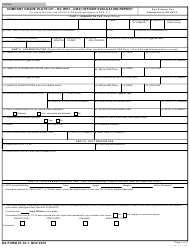 This form was first adopted in 1997 for officer evaluation. It is still used to rate officers' competence, physical and mental condition, leadership abilities and their potential for promotion. 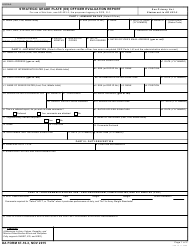 Use this document along with the DA Form 67-9, Officer Evaluation Report during the process of officer evaluation. Use this form to provide the Department of Army Headquarters (HQDA) with information about the rated officer's competence, mental and physical condition and potential for promotion. 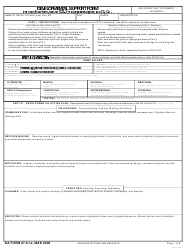 This version of the form 67-10 is used for evaluating brigadier generals (BG) and higher ranking officers. This version of the Officer Evaluation Report (OER) is used for evaluating the performance of colonels. This document is used for providing the Department of Army Headquarters (HQDA) with information about officers' competence and potential for promotion. This form is also known as the Developmental Support Form. It is an optional part of the process of preparing an officer evaluation report. This document is used during the process of officer evaluation and assists the rating chain on the performance and potential assessments of a rated officer.